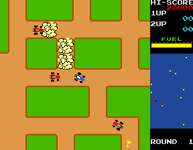 Rally-X is a maze arcade game that was released by Namco in 1980. It runs on Namco Pac-Man hardware, and was the first Namco game to feature "Special Flags", which would become a recurring object in later games (along with the Galaxian flagship). It was the first game to ever feature a "bonus round." The object is to "capture" all of the flags scattered in the field before the other racers hit you. Source: Wikipedia, "Rally-X," available under the CC-BY-SA License.